General surgery billing can be quite challenging for it requires a wide range of expertise not only in the field of general surgery but also in other surgical sub-specialties. Your revenue cycle may be managed well enough to stay afloat in the current market conditions; however, the status quo can quickly deteriorate as market conditions change. With the decreasing reimbursement rates you can’t afford to let your accounts receivables (AR) slip. Efficient revenue cycle management is the key to optimal business health. But, many practices struggle with these critical business functions. 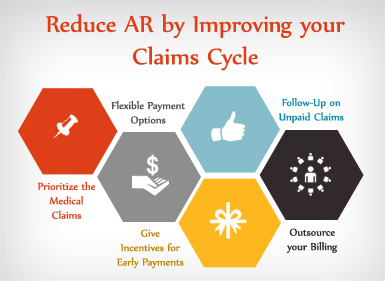 Here are some ways to reduce AR by improving your claims cycle. Set a timeline for each payer so that your medical staff can follow-up on those particular dates. Waiting for too long can pile up your AR unnecessarily. While starting too soon would result in wasting your staff’s time, a payer won’t reimburse you any earlier than they have to. Late payments can be tracked by date, making it easier to prioritize which patients to contact first. The later the payment, the sooner you should follow up. Also, it makes more sense to prioritize the copayments that are of higher value. Some practice management systems automatically assign AR work based on its predefined criteria such as the insurance or payable amount. As a good billing practice, healthcare providers can send friendly payment reminders to patients. Sending email reminders ensures everyone is aware of their payments. Notifying the patients before payments are due can help hospitals avoid accounts receivables claims and give the patients chance to arrange for the payment sum. Sending statements to patients can accelerate the cash flow and save your time. Healthcare providers can also opt for electronic billing as that will offer greater convenience to patients. Electronic statements enable patients to review the balance and make quick, convenient, and secure payments online. If patients cannot pay the whole balance at once, the hospital can facilitate payments in installments. Smaller payments over longer time periods make the costs more manageable for patients. This will save time and the expenses of following up. Many hospitals have penalties for late payments. A reverse approach here would be more effective. If patients who make their payments on time are given incentives they are more likely to continue that practice. You can also provide discounts for patients who pay-off their monthly balances. Likewise, you can start a rewards program for patients who make early payments. Positive reinforcement always has a better effect than payment penalties. Despite all these measures if your practice’s accounts receivables claims keep rising, then the best thing to do would be to enlist some outside help. Many companies offer general surgery billing services that simplifies the revenue cycle, increase the collection rates and these ultimately facilitates more patient inflow. The coding team of a reputed billing company remains up-to-date with the latest changes in codes, state or federal government compliance issues and the payer-specific requirements. Since your claims will be submitted in a timely manner by qualified billing specialists, the cash flow of your practice will automatically improve. Billing partners like MedicalBillersandCoders.com offer solutions which help surgeons collect the highest possible revenues and beat the average industry collections. A dedicated team of well-trained experts is assigned and the latest technology and systems are used to file claims and procure the reimbursements from the insurance companies. MBC has a team of certified coders who are well-trained for handling any payment uncertainty post ICD-10. Since an experienced team will be managing your revenue cycle, you can focus on documentation and patient care. This entry was posted in Accounts Receivables, Revenue Cycle Management (RCM) and tagged accounts receviables, general surgery billing services, Medical Claims, outsourcing medical billing services. Bookmark the permalink.